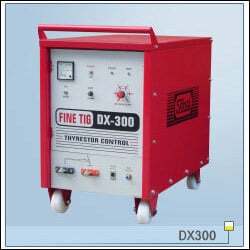 The FINE TIG DX series of tig welders has trouble free highly durable design. These series have same electronic circuit board for every model. No manual tuning done at the time of assembling because PCB is manufactured from 1 tolerance components. Most simple operation, Only to set current and select TIG / STICK mode. Pre programmed "Post flow". Burden free quick setup.